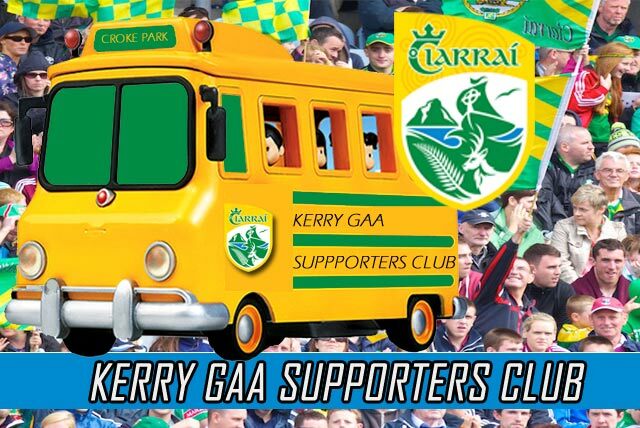 The following are the bus times for Sunday morning 11th March Kerry V Dublin Allianz Football League game. Farranfore 8am, Tralee 8.30a.m and Listowel 9am. Seats must be booked not later than Thursday night 8th March. If you have previously booked a seat there is no need to rebook unless you are unable to travel. Contact Donie O’Leary, John King and Martin Leane. Kerry play Tyrone in the final round of the League on Sunday 25th March in Omagh. This is an overnight trip for the Kerry Supporters. Bookings for this trip can be made on Monday night 12th March in the Listowel Arms Hotel and Ballygarry House Hotel at 8 p.m. This is the final night for bookings with full payment. It was with great sadness and regret that we heard the news on Tuesday last that Jerry Brosnan of Moyvane had passed away. Up to the time of his passing Jerry was President of the Kerry GAA Supporters Club and was a member since it was formed almost 30 years ago. There was no journey too long or too short for Jerry to attend whether it was an underage game within the county or with the Kerry teams in Donegal or Dublin. He was there!! Jerry enjoyed the social side of those weekends away. He was the first to start a song and the last to finish in the early hours of the morning. On the way home on the bus from those long overnight trips Jerry would make his way from his familiar back seat to the front of the bus and would say “give me that thing there” (meaning the microphone) and start the sing song singing about 6 songs in a row. His likes will never be seen again ‘Jerry thanks for all the great memories’. The Supporters Club and the GAA world send their sincere sympathy to his wife Nodie, son Mike, daughters Kay, Brenda, Aileen and Geraldine, daughter in law Breda, sons in law Tom, John, David and Aidan and his grandchildren. May the sod rest lightly on his soul.